Want to know a secret about the New Fat Ladies? We really really really like cake – reading about it, baking it and of course, eating it. We make a lot of cakes, and over the coming months we’ll be sharing at least a few of our favourites from events in our lives, both big and small. The first is a cake that S-J baked for her beautiful partner’s 30th birthday party. A two tiered rich chocolate cake with lashings of white chocolate frosting, decorated with edible wildflowers from her garden. I was super sad to not be there for the party to eat a slice or three, but now I get to write about the cake and that’s almost as good as getting to eat it, right? Well no, but I’ll talk about my birthday cake in a second, and I definitely got to eat that one! So let’s get to the recipes. And a couple of tips. Look out for the tips. Some maths will be required to work out how many batches you will need to replicate the number of layers that S-J made or to get to the size that you need (maths that ends in cake is maths worth doing). If you do just one batch as is written below, you will get a lovely cake more suited to 8-10 mouths. Tip: This cake is best when you make it with ingredients at room temperature, so make sure you remove the butter, eggs and sour cream from the fridge at least 2 hours before baking. Preheat oven to 180C. Grease and line your tins. Add all ingredients to the bowl of your food processor and blend until you have a smooth, thick batter. Pour mixture, split evenly, into your tins. Place tins in oven and bake for 35 minutes or until a skewer inserted in the center comes out clean. Leave to cool for ten minutes on racks, then turn out to cool completely. This cake is super prone to splitting, but you don’t need to worry about that as very soon you’ll cover any unsightly cracks with luscious frosting. To make your frosting, start by boiling a saucepan of water. Reduce the heat to a very low simmer and put a glass or metal bowl on top (you just made a homemade baine marie, go you! ), add butter and chocolate to bowl and, once melted, stir to combine. Tip: this bowl will be REALLY HOT, use an oven mitt to move/hold it. Remove bowl and let cool slightly. Add the golden syrup, vanilla and sour cream to the chocolate mixture and stir to combine. Add the icing sugar into the bowl of the food processor and whizz briefly to remove any lumps. Pour the chocolate mixture into the processor and process until frosting-y. Depending on your climate you may need to add a little more of either sour cream or icing sugar to achieve the right consistency. Slather the icing on cakes and pile up. 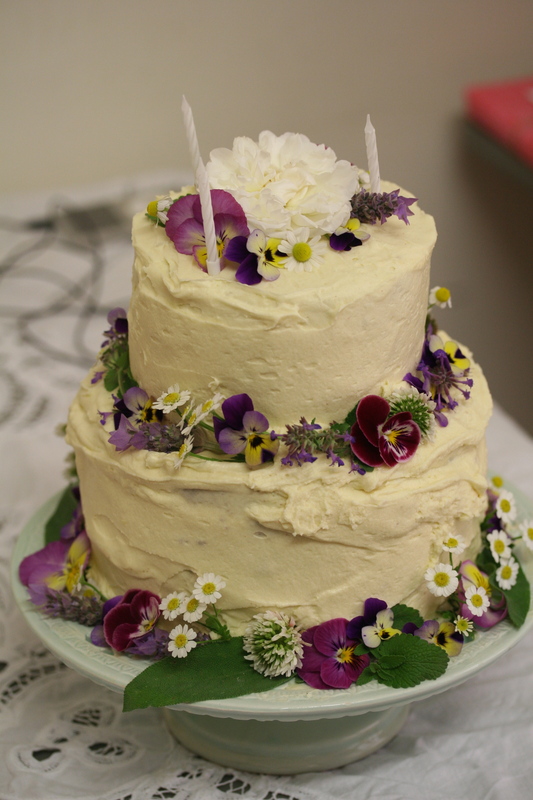 S-J decorated this cake with fresh edible flowers from her prolific garden, but it would also be lovely with chocolate curls or fondant decorations. I forget how gorgeous edible flowers look on cake… just bloody marvellous! Thanks, Jess! It is one of my favourite decorating techniques as I am absolute pants at all the other kinds!